Did you know that meningitis is one of the biggest causes of hearing loss? Bacterial meningitis attacks the nerve cells in the inner ear, and can cause total deafness almost overnight. If this happens, cochlear implants are often the best way to get back your hearing. 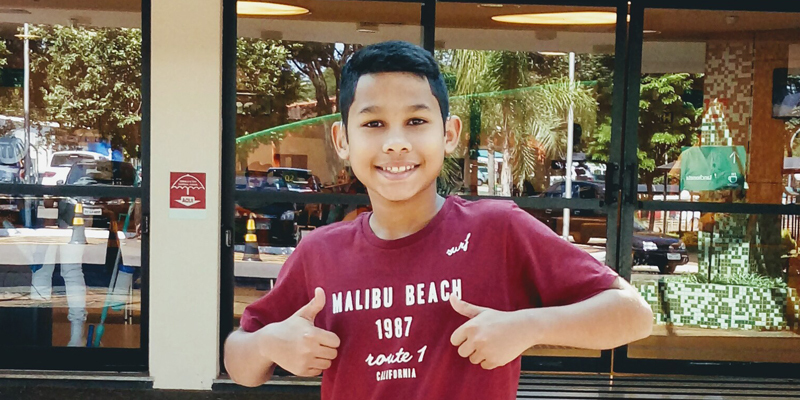 Meet Kadu, a young cochlear implant user from Brazil. After contracting meningitis as a baby, his mum, Debora, was devastated to hear that her son had severe-to-profound sensorineural hearing loss. The news led Debora on an inspirational cochlear implant journey, to give her son the brightest future possible. For a long time, it was just Kadu and me. As a single mother, we went through a lot of difficulties that make me sad just to think about them. Amongst all the difficulties that we experienced, money was the biggest challenge. Kadu was born 4 weeks prematurely and contracted an infection in the hospital that evolved into bacterial meningitis. He stayed for almost a month in the intensive care unit at the hospital. When discharged, Kadu was referred to several specialists to check on his health. I hadn’t noticed anything different in Kadu—he was an apparently perfect, beautiful baby. To my sadness and despair, Kadu did not pass his first hearing test. Several other tests were carried out before his diagnosis of severe-to-profound sensorineural hearing loss. After the discovery of Kadu’s deafness, I was overcome with sadness. I had no idea where to turn. It took the intervention of a specialized professional to help me realize that this situation was not the end of the world. I was a single mother, alone with a hearing impaired baby. I had no choice—I had to be strong. I began to study and learn everything I could about meningitis, deafness, and what could be done to improve my son’s quality of life. I went out in search of treatment or technology that could improve my son’s quality of life and future. It was there that “angels” were sent in the form of speech therapists who introduced me to a new technology called a cochlear implant. The possibility of seeing my son hear and speak normally filled my heart with hope. I had no doubts about the decision to give him what I consider a miracle. In the city where Kadu and I lived, cochlear implants were unfortunately not yet available. I found out about a pioneering hospital that could do his treatment, Centrinho De Bauru. However it was more than 3000 kilometers away. I didn’t know how I would be able to afford to travel there with Kadu and to give him the treatment he needed. With the support of family, friends, and neighbors, we started a beautiful campaign to raise funds. With the money raised, I was able to take 6-month-old Kadu to Bauru and give him hearing aids, which was the first step towards the dream of one day giving him a CI. Just after his first birthday, Kadu got his MED-EL cochlear implant. Once Kadu was implanted, our daily routine and activities totally changed. I put everything into helping him in the critical first stages of learning to listen. I quit my accounting job, so that I could dedicate my time exclusively to my son’s rehabilitation. We moved from our hometown to Bauru in search of the best cochlear implant treatment and support. I returned to studying and graduated in education, to better accompany Kadu in literacy, which can be a difficult phase for children with cochlear implants. In Kadu’s rehabilitation, I began to value the beauty of sound. One day, when Kadu was still learning to listen with his CI, I let a spoon fall to the ground. He suddenly turned to me and threw his hands in the air, wondering what the sound was. I burst out with joy and threw another spoon on the floor and said “drop the spoon”, “drop the spoon”. I realized how beautiful and wonderful the sound of the spoon falling on the floor is. From that day, several spoons could always be found on the ground! At the time when Kadu was born in Brazil, the Newborn Hearing Test was not mandatory. Kadu only did it because of his hospitalization due to meningitis. It is amazing how a simple test has the power to change the life of a child and his whole family. I led a group of mothers in fighting to make this examination accessible in public maternity wards in our city. With the support of professionals and politicians we have made great strides. Today in Brazil, the hearing test is performed on all newborn babies. I regularly blog and share about Kadu’s hearing journey on social media. My motivation is to give hope to families who have just discovered their child’s deafness. I want to show them that cochlear implants have the power to change the life and future of their child. Kadu is an example of overcoming challenges and finding success, thanks to his implant from MED-EL. I am very proud of my son—he is a warrior. My piece of advice to other parents would be: don’t waste time deciding whether or not to get cochlear implants. Time is critical in order to achieve the best results for your child. What I can say to parents who are starting this CI journey is that it will not be easy. However with dedication, love, and determination, the results will be great. Nothing is more gratifying after a tiring day of struggling against the silence, when you hear your hearing-impaired son say “Good night, mommy I love you”. It recharges you and makes you realize that it was all worth it, and that you would do it all over again if you needed to. Today 12-year-old Kadu is just like any other kid his age. He listens, speaks, sings, dances, and interacts with everyone. I do not regret the changes I had to make in my life for my son, it was the best decision I could have made. In some ways, I do not know what it’s like to have a deaf child. My son with severe-to-profound hearing loss is the biggest listener I know! Thanks, Debora! Want to see what Kadu was like as a young child with cochlear implants? Check out our video below! Has your child just been diagnosed with hearing loss as a result of meningitis? Check out our handy guide about what to do next.